Have you ever fished for Walleye? I just returned from a family fishing trip in Canda where Walleye was one of our main targets. We caught HUNDREDS of fish when we were up there. We released most of the fish we caught, but each of us was able to return with a one day’s limit worth of Walleye (amongst other fish species). One of my favorite things about the Canada fishing trip was the copious amounts of fried fish we ate EVERY SINGLE DAY. On the drive home all I could think about was eating more fish. I was determined to cook some walleye on the smoker that tasted just as good as fried fish, and I am sooo pleased with the results this smoked walleye recipe produced. I’ll be talking about walleye throughout this post, but I’m certain this recipe would work well with other types of fish like Halibut, Pike, or Ling Cod. The first thing I do once I have my fish fillets out of the fridge, is chunk the fillets into 4 inch long pieces. After you’ve cut the fillets into smaller portions, let the fish pieces soak in a bath of whole milk. While the fish is soaking you can get your smoker and any ingredients you’ll be using ready to go. Why Should I Soak Fish in Milk? I’ve soaked my fish fillets in milk for years – we used to soak halibut fillets in milk when I was working in Alaska. According to this Lifehacker article, soaking fish in milk for a short period of time pulls a chemical out of the fish called Trimethylamine. That chemical is what is responsible for the “fishy” smell. A 15-minute bath in milk is all it takes to remove most of that chemical from the fish! Now that your walleye is “chemical free”, it’s time to add a rub to the surface of those white fillets, and prep them for the smoker. 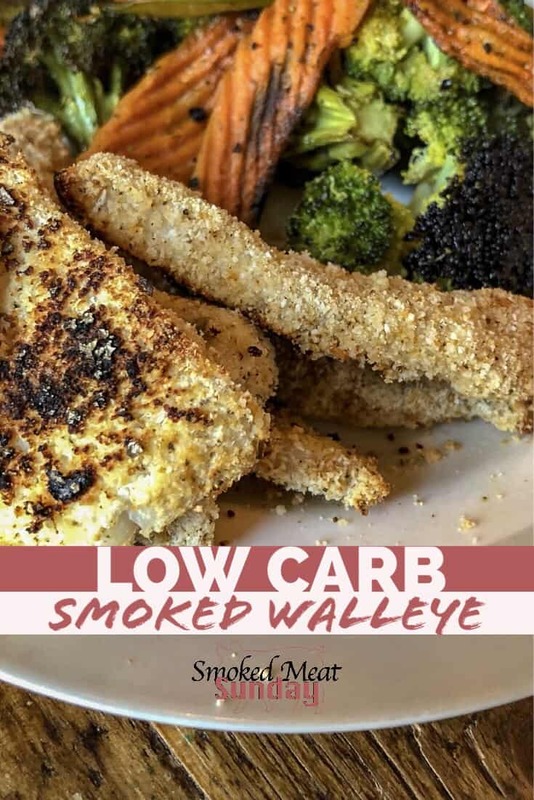 We try to eat low carb as much as possible in our house, so my other goal with this smoked walleye recipe was to make it low carb. 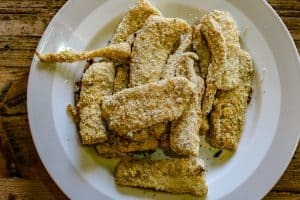 Gently mix all the ingredients, and then one by one, pull a chunk of fish fillet out of the milk bath, dredge it in the dry ingredients, and then place the walleye on a grill rack. Each fillet should be completely covered by a light dusting of the rub. Once all of the walleye chunks are ready to go, it’s time to cook them on your smoker! This is the easiest part of the whole recipe. We’re gnna smoke the fish for a short period of time first, at 150 degrees. Place the walleye fillets in your smoker and let them smoke for 15-20 minutes, and then remove them and adjust your smoker to cook at 400 degrees. Once the smoker is up to temp, put the grill rack full of fish back in the smoker, and let the fish cook for approximately 15 minutes, or until the internal temperature of the fish is 145 degrees on an instant-read thermometer. 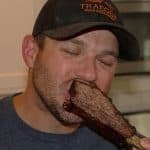 When the fish hits that internal temp, it’s time to pull it off the smoker, and serve immediately! 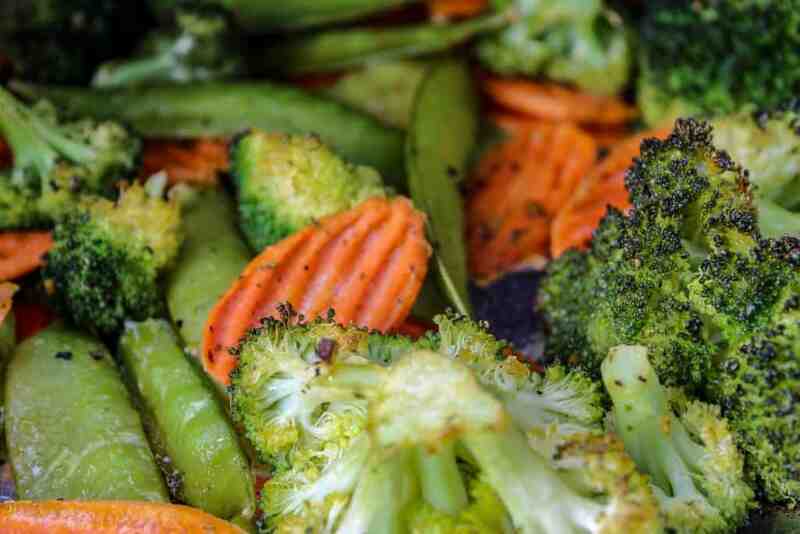 We paired this fish with some mixed veggies, and we couldn’t have been more pleased with the results. 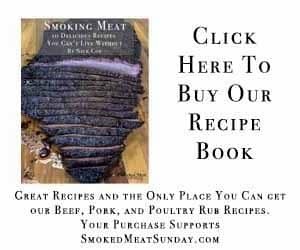 Do you have a smoked fish recipe you love, that is also low carb? I’d love to hear about it. Leave me a note in the comments or send me an email so I can give it a try! 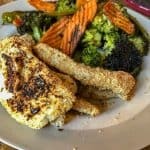 A delicious low carb alternative to fried fish - this walleye recipe is fantastic! Set your smoker up to smoke at 150 degrees using indirect heat. Place the fish in the smoker and let them smoke for 20 minutes. After 20 minutes remove the fish from the smoker and crank the heat up to 400+ degrees. I have a Traeger Pro 34, and used the "high" temperature setting to get my temps where they needed to be. When the fish hits the internal temp of 145, it's time to pull it off the smoker, and serve immediately! 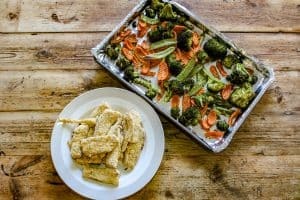 We paired this fish with some mixed veggies, and we couldn't have been more pleased with the results. You spelt Canada wrong eh!